Image caption Tha dòchas ann gun toireadh goireasan do dh'iataichean togail mòr do dh'eaconomaidh na Hearadh. Thathas an dòchas goireasan ùra a chur air dòigh anns na Hearadh airson na tha de bhàtaichean a' tadhal air an eilean. 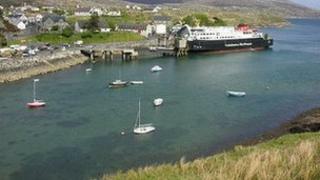 Tha Urras Cheann a Tuath na Hearadh a' cur rompha £1.3m a thogail mu choinneimh a' phròiseict. Bhiodh aon phontùn air an Tairbeart agus fear eile ann an Scalpaigh. Bithear a' tagradh airson airgead bho bhuidhnean poblach leithid Comhairle nan Eilean Siar, Iomairt na Gàidhealtachd 's nan Eilean agus Oighreachd a' Chrùin. Tha grunn choimhearsnachdan anns na h-Eilean Siar air goireasan ùra a chur air dòigh bho chionn ghoirid 's iad ag amas air tuilleadh iataichean a thaladh. Chaidh marina ùr fhosgladh ann an Steòrnabhagh anns an Lùnastal agus chan eil ach beagan sheachdainnean ann bho chaidh an aon sheòrsa goireas fhosgladh ann an Loch nam Madadh. Thuirt Coinneach MacLeòid, a tha na bhall den chomataidh-stiùiridh anns na Hearadh, gu bheil tòrr bhàtaichean a' tighinn a-steach an-dràsta, a dh'aindeoin 's nach eil goireasan sònraichte ann dhaibh. Thuirt e gum faodadh buannachdan mòra a bhith ann dhan eaconamaidh ionadail le barrachd dhaoine a' frithealadh nam bùithdean agus gum faodadh barrachd ghnìomhachasan toiseachadh ann an ceann a tuath na Hearadh. Dh'iarradh an t-Urras gum biodh na goireasan ann ro dheireadh na h-ath-bhliadhna.